Colleges shutting down has made the news recently. 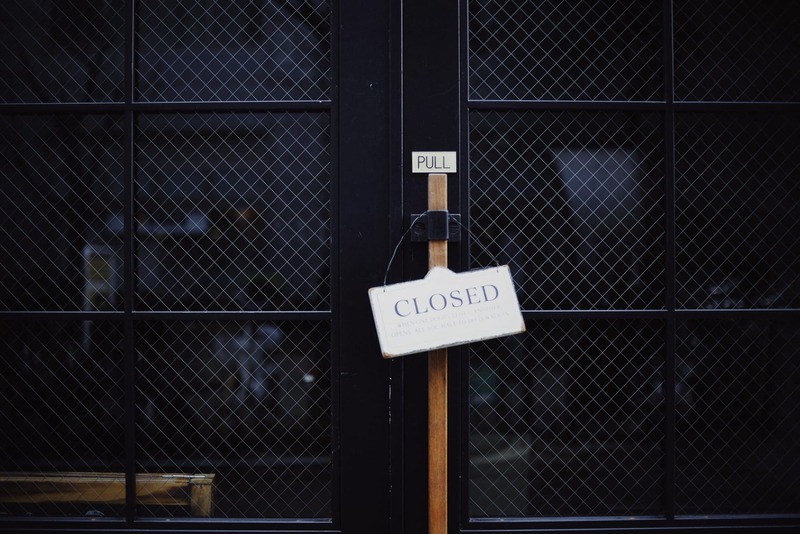 Large college conglomerates such as Argosy University, South University and the Art Institutes have announced they are closing their doors. So, what are students to do when their college shuts down? This isn’t the first time students have been forced to find a different way to complete their degree–or decide to give up on it entirely. Education Dive reported over 100 for-profit colleges and universities that shut down between the 2016-17 and 2017-18 academic years. In 2008, an art school in Santa Fe, New Mexico, the College of Santa Fe, announced a shut down. Students were notified over Thanksgiving break that the college would be closing its doors at the end of the year. When students came back after break, professors and faculty talked with students about what had happened and what their options were. “It completely consumed everything we did for a few days in class time. Then, just continuing on to having office visits or after class visits with students, staff and faculty meetings…it took up a lot of time,” said Hank Rogerson, former professor at the College of Santa Fe. Rogerson said he was talking to students about the news, how they felt about it, and what they could now do to complete their education. He explained that while there was a wide spectrum of reactions, there was mainly anger and disappointment from students who did not want to leave the college and the relationships they had formed. At the same time, he now had to look for a new job himself. The administrators of the college came up with a plan for teach-out options, which is a common option for students when a school closes. In this particular case, teach-out options allowed students to attend other colleges and universities without doing a full application, and that would transfer their credits. Other universities may also “teach-out” their own students after closing if the students only need a few credits. However, Rogerson advised that students go to a different school to finish their degree, either through transfer or teach-out. Rogerson explained that teach-out through the original university might be an issue when it comes to diploma legitimacy to future employers, as they may be skeptical of a degree earned while a school was shut down. He also brought up the potential issues students may encounter with obtaining transcripts from a school that is closed, as communication with staff that is no longer focused on this college may be difficult. Additionally, Shields recalled representatives from other schools coming to the College of Santa Fe to explain their similar programs and offer incentives for transferring to their schools, such as scholarships and reduced fees. One of these colleges was Columbia College Chicago. “When Columbia came down and said ‘we have an editing program,’ I said ‘fine, let’s just do it.’ So when I moved to Chicago I thought, ‘let’s get through these next two years and try to get a job,’ said Shields. Shields applied to other colleges as well, but decided on Columbia College Chicago because they were concentrated in the film program, which she wanted to do. The school offered her financial incentives, including a small scholarship and free housing for her first year. Several of Shields’ friends were transferring to Columbia College Chicago as well, so she knew she wouldn’t have to completely start over socially. Shields explained how during this process, she benefited from the fact that she had already established what she wanted to do academically during her time in Santa Fe, so the search process was not as difficult as it was the first time she applied to college. “I think it went as well as it could have gone. Columbia is a very particular school where you have to be focused on what you want to do and take initiative. I got lucky because I was so focused and I ended up getting an internship right out of college,” said Shields. Peterson’s videographer, Jason Natzke, also attended the College of Santa Fe. However, after the college shut down at the end of his second year, he was able to return to the area to finish his degree, which opened new opportunities for him. “If your college closes, it can actually be a blessing in disguise. While it was hard to transfer halfway through my college career, it opened up more opportunities that I wouldn’t have had if I had stayed put. Change always leads to growth once you move past the uncomfortable part of it,” said Natzke. As for preventable measures, Rogerson advised doing your due diligence when deciding on a school and getting a good sense of the school standing, administration, and financials. While you may not always be able to predict a college closure, a college’s administrative and financial structure is something to look into when choosing a college. While it’s disappointing to have your college shut down, and can be stressful to find out what to do next, there are options. Teach-out options can help make the transition run smoothly. If you do not want to go to one of the colleges offering these options, there is always the option to apply for a transfer into another school. Talk to your professors, peers, faculty, and administrators at other colleges you’re interested in to gain information and choose your next steps. For more information on transferring, read Transferring Colleges: How to Transfer to Another College or University.